Purported images of 'gold' iPhone 5S from Macboutic emerged on Friday. 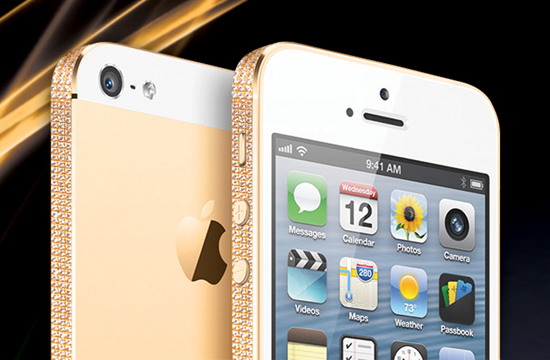 iPhone 5S may go gold and move up to 64-bit computing, according to an analyst. A widely-cited analyst echoed previous rumors about the iPhone 5S while adding that there will be a 128GB option for the new phone and possibly a 64-bit processor. Expect a new 128GB storage option for the iPhone 5S, KGI Securities analyst Ming-Chi Kuo said Thursday (via AppleInsider). In February, Apple began offering a 128GB option on the iPad 4 for the first time. And gold -- maybe better described as "champagne" -- will be a color option on the upcoming phone, Kuo said, echoing a previous report from Japanese site Macotakara. The analyst also claimed Thursday that the iPhone 5S will include a new A7 system-on-a-chip (SoC) based on ARM's 64-bit ARMv8 architecture. That would be significant as Apple's previous A series processors and popular ARM chips used in smartphones are 32-bit. The rear camera on the 5S will keep the 8MP sensor but get a larger f/2.0 aperture (that would match the HTC One) with dual LED flash -- confirming rumors circulating last week. If accurate, that aperture would be significantly larger than the iPhone 5's, i.e., more light gets through, improving image quality and low-light performance. Kuo also repeated another rumor going around last week about a sapphire home button with fingerprint sensor. The 5S announcement is expected in mid-September.